Goal: Enhance the beauty of PH unit. Create a clean background for client's artwork collection. Modernize 2 1/2 bathrooms. Overall duration: 3 years. Phased approach. The client visited Studio Verticale and fell in love with the Italian doors we carry. After the door project, the bathrooms were next. A recent undertaking: a complete kitchen overhaul. All doors in the residence were replaced with Italian counterparts. White glossy polyester and white lacquered glass are the dominant panel finishes that create a striking contrast with the red cherry floors and form an arresting partnership with the client's artwork collection. All passage doors feature handles with no back plate that appear to float in the air. In the bathrooms, glossy white cabinets are suspended on the wall. 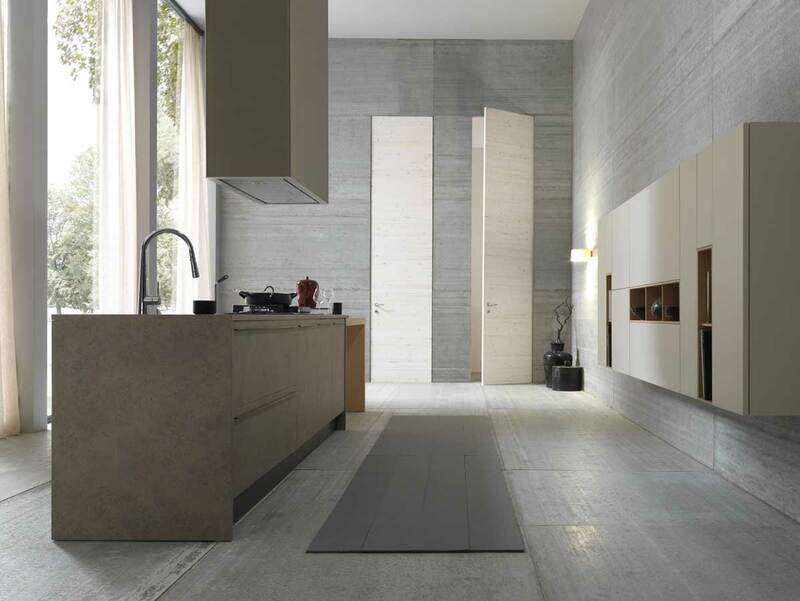 Integrated tecnoril (material similar to corian) counters, sinks and shower bases throughout. The stunning glossy white kitchen features Modulnova cabinetry, glossy black backsplash, extra thin corian counters and textured stone raised peninsula. A blend of finishes that work cohesively to form a modern kitchen. Longhi sliding systems in white lacquered glass on all closets in the unit. Lualdi glossy white polyester 'Rasomuro' doors with recessed aluminum frame as passage doors in all private areas of the home. Lualdi glossy white polyester surface mounted 'Outline' doors on pantry and fire escape exit. Modulnova suspended glossy lacquered vanities in 2 bathrooms and powder room. Tecnoril counter tops. Integrated inclined sink in tecnoril in the master bathroom. Tecnoril rectangular vessel in the powder room. Integrated rectangular sink in tecnoril in the guest bathroom. Mirrors and vanity lights. Modulnova shower system comprised of tray & base in tecnoril, and glass enclosure with a sliding door. Modulnova kitchen cabinetry, counter and peninsula tops.